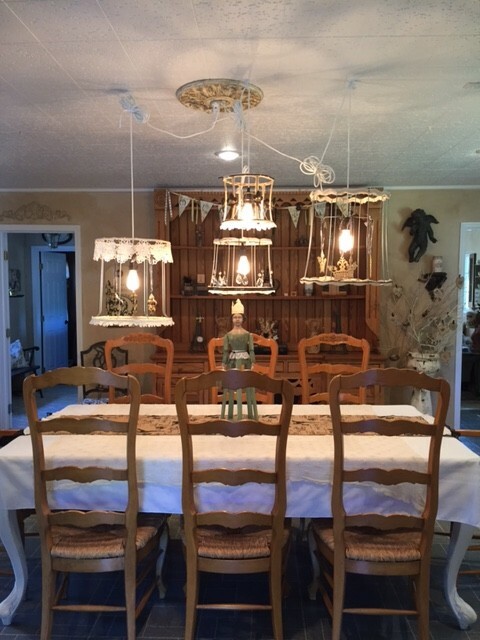 Kim Bridges is the owner and operator of the Queen Bee Art Cottage and Retreat. Hidden in the trees of Holiday Valley, the Queen Bee Art Cottage and Retreat is a place removed from noise and chaos. It was created as an artistic escape for women and has since become an oasis for scrapbook parties and bridal showers alike. “It’s a rental space for women,” says owner Kim Bridges. “It caters to crafters, but it’s also a place for specialty birthday parties, bridal showers, baby showers, girlfriend getaways and luncheons” — among other things. The cottage is versatile. With two living rooms, two bedrooms, a reading nook, a kitchen, a laundry room and both an indoor and outdoor porch, a wide variety of groups find that the venue meets their needs. The little cottage is set on the edge of a 26-acre farm. Both forests and fields are within walking distance of the retreat, which is a bonus for artists looking to get inspired by nature. “[Renters] can walk across a wooden bridge over Schneider Creek to a field with walking paths,” says Kim. While exploring the grounds, guests are also encouraged to visit the sheep and pygmy goats on the farm. “There’s an abundance of deer watching and there might even be some wild wiener dog sightings,” she adds with a laugh. For groups that want an indoor getaway, the cottage offers something else. “It’s not your usual rental space,” Kim says. The cottage is filled with décor reminiscent of the French countryside, including rustic furniture and antiques all with a soft pastel color palette. The distinct style helps create an atmosphere of timelessness. A weekend spent at Queen Bee Art Cottage and Retreat is far separated from the stress and constraints that exist in the outside world. 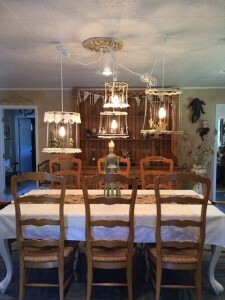 The main floor of the cottage has a dining room with a table that is perfect for scrapbooking. However, while the cottage was created in support of the idea that women must have time and a space of their own in order to make art, Queen Bee Art Cottage and Retreat has evolved into a place for all kinds of women, whether or not they are using it for artistic purposes. “For girlfriends getaways we have a flat screen TV with chick flicks,” Kim says. “And we have a posh menu, where I can do some meals or all the meals, and I can arrange for a masseuse to come in.” However, most groups that come choose to bring their own food and take advantage of the full kitchen available on-site. “Normally people rent it for day use if they’re doing a shower or birthday party,” Kim says. “Or women rent it Friday through Sunday if they’re doing a girlfriend weekend or scrapbookers’ weekend.” Summer and weekends are the busiest time for Kim, and reservations for those coveted spots must be made months in advance. Kim says to make a reservation, prospective cottage-goers just have to give her a call. Kim’s phone number can be found on the cottage’s website, along with information about directions, pricing and events. 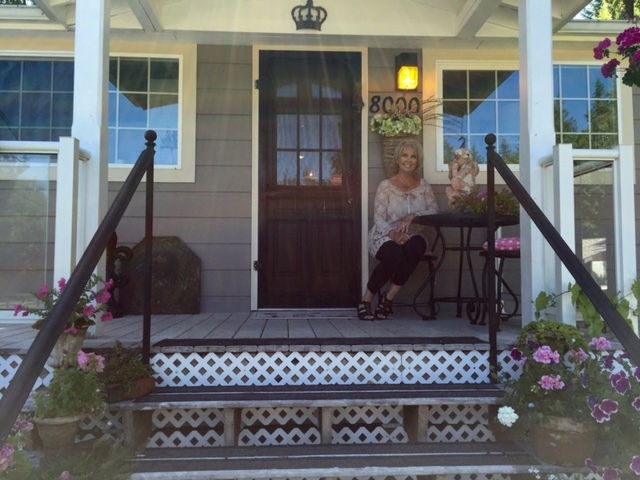 Kim usually welcomes guests to the cottage with goodie bags or fresh baked cookies. Her goal is for renters to have the most relaxing weekend or the most artistic inspiration possible during their stay. She wants guests to have more than an event, she wants them to have an experience — a retreat into a world without obligation. The Queen Bee Art Cottage and Retreat was designed to be just that — a retreat. An immersion into a microcosm of peace and tranquility.